What Does a Nurse Practitioner (NP) Do? A nurse practitioner (NP) provides primary and specialty healthcare. Like a physician, he or she assesses and diagnoses patients, orders laboratory tests, prescribes medications, and manages health conditions. NPs also educate their patients on how to make healthy lifestyle choices. Because some states restrict their duties, what they are allowed to do differs depending on where they practice. This is one of several occupations that fall under the general title, Advanced Practice Registered Nurse (APRN). Other job titles are Nurse Anesthetist, Clinical Nurse Specialist, and Nurse Midwife. Nurse practitioners work in a variety of specialty areas including Acute Care, Gerontology Health, Oncology, Women’s Health, Neonatal Health, Psychiatric and Mental Health, and Pediatric/Child Health. NPs also work in sub-specialties like Cardiovascular, Hematology and Oncology, Neurology, Sports Medicine, and Urology. As primary healthcare providers, nurse practitioners help patients maintain good health and treat their illnesses. This requires taking into account their health histories and any symptoms they are experiencing. Laboratory tests provide supplemental information that will alert them to abnormalities that may not be revealed through a conversation with the patient or physical examination. Nurse practitioners encourage patients to become active participants in their own well-being. The means through which they achieve this is by providing education and counseling to help patients understand how to maintain their own good health, or mitigate symptoms and advancement of diseases. Like all healthcare professionals, NPs don’t consider their job done when a patient leaves the office. Outcomes are an important aspect of their practice. It is essential to determine whether the treatments they administered or recommended are effective. Nurse practitioners earn a higher median annual salary than other health diagnosing and treating practitioners. Their pay varies based on location and experience. Before one can begin preparing to become a nurse practitioner, he or she must be licensed to practice as a registered nurse (RN). That requires earning a bachelor’s or associate degree, or a diploma in nursing and getting a state-issued license. While most graduate programs prefer to admit candidates who have a bachelor’s degree, some offer a bridge program to those who have an associate or diploma in nursing. Master’s or Doctorate in Nursing Practice: Most people enter this profession by completing a Master’s Degree in Nursing Practice, but some choose to get a Doctorate in Nursing Practice (DNP) or a Ph.D. Master’s or Doctoral candidates receive advanced clinical education through classroom and clinical instruction. Coursework varies according to the specialty, but usually includes advanced pathophysiology, pharmacology, and health assessment; health information technology; and leadership. NP Licenses: All states and the District of Columbia require nurse practitioners to be licensed. One must have a state-issued RN license and a master’s degree or doctorate in nursing practice. It is also necessary to pass a national certification exam for the population or specialty in which he or she is trained. Communication Skills: To communicate with their patients and colleagues, nurse practitioners need excellent listening, speaking, and interpersonal skills. They must be able to understand what their patients are telling them, clearly communicate instructions, and build and maintain a trusting relationship. Problem Solving: Based on clinical interviews, physical examinations, and lab test results, NPs must identify diseases and other health conditions. After making diagnoses, they need to produce treatment plans. Critical Thinking: When developing a treatment plan, an NP must be able to evaluate various options to treat a condition and then identify the one he or she decides will have the best outcome. Compassion: Nurse practitioners must be able to sympathize with sick, and also worried, patients and their families. Leadership Skills: NPs usually manage other members of the healthcare team such as RNs and licensed practical nurses (LPNs). 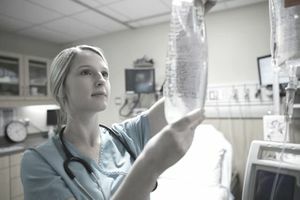 Along with other advanced practice registered nurses, nurse practitioners can look forward to an excellent job outlook. The U.S. Bureau of Labor Statistics (BLS) predicts employment will grow 36% between 2016 and 2026. This is much faster than the average job growth for all occupations. The BLS cites several factors that contribute to this outstanding growth. They include an aging population of baby boomers and an emphasis on preventative healthcare. In addition, many states are allowing nurse practitioners to perform a wider variety of services, which has led to more patients seeking them out. Most nurse practitioners work in physicians’ offices, hospitals, and outpatient care centers. Some make housecalls to patients’ homes or travel long distances to provide healthcare services in underserved areas. Most nurse practitioners have full-time jobs. Some work evenings, weekends, and holidays, and some—particularly those who work in critical care or obstetrics—are required to be on call to respond to emergencies. The American Association of Nurse Practitioners (AANP) provides a detailed state-by-state directory that includes licensure requirements and state laws regarding the scope of practice. Use AANP’s NP Program search to find a Master’s or doctoral program. Look for job openings on Indeed.com.